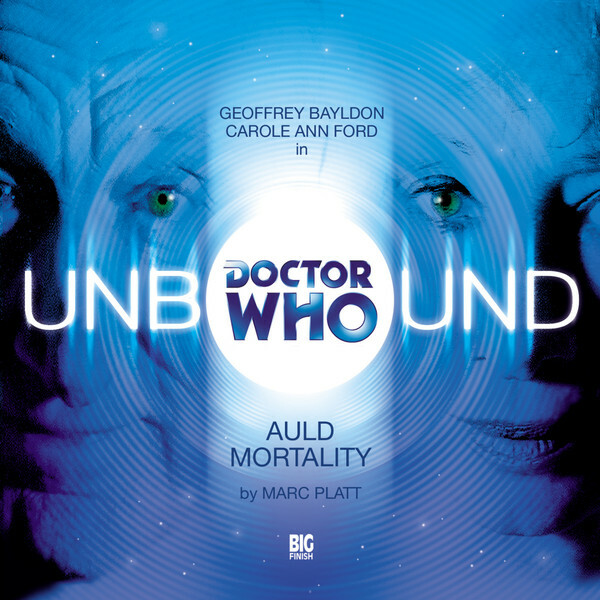 Big Finish: Doctor Who Unbound - AULD MORTALITY Review | Warped Factor - Words in the Key of Geek. More than decade ago, when Doctor Who was approaching its fortieth anniversary, Big Finish celebrated the occasion in a rather unusual way. Across a handful of CD's, they asked a number of questions that could only be answered by going outside the series continuity. The result was Doctor Who Unbound and the first release, Auld Mortality, asked perhaps the biggest “what if?” of them all: What if the Doctor had never left Gallifrey to begin with? Playing the alternate first Doctor is Geoffrey Bayldon, an actor who interestingly turned down the chance to play the First Doctor in 1963. It's clear from the script alone that this is a somewhat older version of the First Doctor, albeit one who stayed on Gallifrey and became a celebrated author by writing a book called “An Adventurer In Space And Time”. Bayldon though certainly isn't William Hartnell but, without copying him, Bayldon nevertheless captures his spirit. There's the occasional perfectly timed “Hmm”, the moments of crankiness and Bayldon's excellent chemistry with Carole Ann Ford. How much of that is down to the script and how much of it is down to him is unclear but what is apparent is that Bayldon gives a splendid performance that captures the spirit of Hartnell without being an imitation. In fact, one might go so far as to say that he captures Hartnell better than Richard Hurndall did in The Five Doctors in 1983. Joining Bayldon is Carole Ann Ford, returning to the role of the Doctor's granddaughter Susan. This is isn't the whimpering, often frightened young girl we saw back in the 1960s though. This is an older and wiser Susan, one who has come in search of her grandfather one last time and is drawn into events that will soon determine her destiny as well. While the writing does occasionally echo back to the original character in early scenes (right down to her twisting her ankle at one point), Ford plays this version of Susan quite well and her aforementioned chemistry with Bayldon's Doctor makes the entire situation all the more believable as a genuine possibility. The supporting cast is strong too. Derren Nesbitt (who in another connection to the first Doctor era was in the now missing story Marco Polo) is of particular note as the Doctor's politically ambitious uncle Quences whose real role in events only becomes clear as the story reaches its end. There's appearances from Big Finish regulars such Toby Longworth as the Doctor's robotic servant Badger, and Ian Brooker as Surus, Hannibal's talking elephant (yes dear reader you read that right). Each of them get chances to shine, particularly with Bader and Surus' moments of comic relief. There's also of course Marc Platt's script. Platt was something of an obvious choice to write this story given his novel Lungbarrow which (whether its canon or not) is one of the definitive depictions of the Time Lords and Gallifrey. It's perhaps no surprise then that Auld Mortality brings together some elements from that novel (such as Badger and Quences) as well as the Gallifrey of the old series with mentions of the Time Lord high council, Gold Ushers and Time Lord politics. Platt's tale though is far more than just that. The story, with its use of Hannibal crossing the Alps, also hearkens back to the first Doctor's televised era by inserting a historical element in the spirit of Marco Polo or The Massacre and, in a way only a fan could do, then sit there and poke fun at the historical inaccuracies. It's also a tale of the sometimes thin lines between harsh reality and escapist fantasy, and how crossing that thin line can consume someone. It's a point brought out in some of the most beautiful moments and dialogue of the story, such as the scene at the tree of possibilities and the excellent audio montage at the end, scenes that also celebrate the diversity of Doctor Who itself. Platt makes Auld Mortality more than a simple “what if?” story. Auld Mortality is then is as much a celebration of Doctor Who itself as it is a “what if?” story. It's a story well told thanks to strong performances from the cast, from an excellent alternative first Doctor in the form of Bayldon and two returning cast members from the show's earliest days. Yet it is Marc Platt's script which encompasses elements from at least two different mediums into a new story entirely that reminds us that this is a series that, after all, can go anywhere in time and space and celebrates what Doctor Who is capable of. More than a decade on, Auld Mortality remains the first and amongst the best of the Unbound releases and one well worth revisiting.